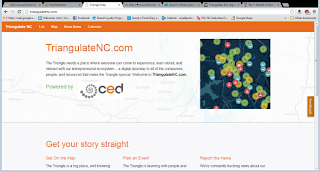 CED today released its long-anticipated TriangulateNC.com, an interactive site that represents the entrepreneurial activity in the Research Triangle. It’s focused initially on technology and life science companies, with expansion opportunities for industries such as advanced materials sciences and the ‘makers’ movement – some of the most active growth areas for our region. We’re hoping that you will help us continue to expand on this map. We’re looking for companies with headquarters (or major operations) in Wake, Durham or Orange Counties, companies that were founded in this region, and are privately held (or have done an IPO or become a wholly owned subsidiary of a larger company but retained brand identity). We’d like to you sign on, expand the information we have on your company (or add it! ), and continue to provide the site with milestone information. We also built this tool, with great help from our friends at Relevance, to be the central go-to calendar for community events that would be of interest to entrepreneurs. Many of our community partners have already added their upcoming happenings – we invite you to add yours as well, and to come back often to see ‘what’s up’ in the region. This site belongs to entrepreneurs in the Triangle. You are encouraged to input and refresh your company information regularly, to keep the region – and ultimately the world – up-to-date on what your company is doing. Thus far, CED has created the database and architecture for the map, calendar and news flow. CED will continue to curate the information and manage the site to assure high quality standards, supported by our 75+ community partners who share an interest in a vibrant entrepreneurial community. The Research Triangle is among the country’s top entrepreneurial centers. Yet, getting the information that helps to tell that story has not been easy. 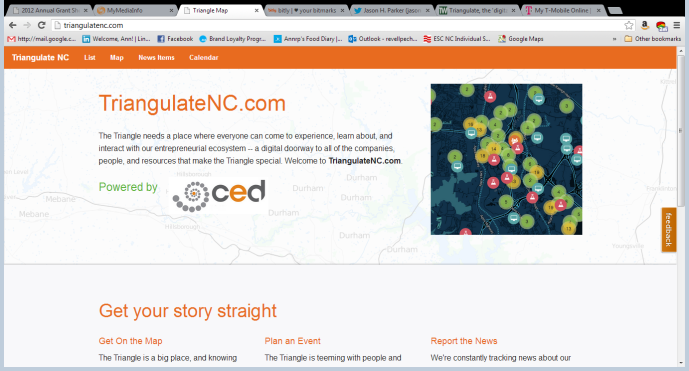 TriangulateNC.com is designed to be a central information hub -- the single stop for information on what’s happening entrepreneurially in the Research Triangle area. Help us help the world find out how great this area is. We’ve started the process, but to make it great requires YOU. Give us feedback (there’s an orange tab on the right side of the homepage) or contact Hal Thomas for comment.